JON FORTT: Carl, thanks. Yes, I’m here at the IBM Think Conference. 26,000 attendees. Lots of focus on the cloud, hybrid cloud. IBM CEO, Ginni Rometty. Thanks for having us. JON FORTT: Watson Anywhere now. You’ll be able to run Watson in Amazon’s cloud, in Microsoft’s Cloud, as well as in IBM’s cloud. Why do this? And kind of percentage wise, how much do you think it can grow the cognitive solutions group? GINNI ROMETTY: This is a big piece, not just of Watson, a big piece of hybrid cloud. Which, you’ve heard me say, we think that’s a trillion dollar market and we’ll be number one in it. So that gives you a good feeling. JON FORTT: You’re announcing this cloud integration platform, hitting on that same theme you were just talking on. And we’ve heard it from other companies, too. Businesses are demanding to be able to get data out of various silos, get them ready to move to the cloud. How is IBM’s approach different with this different than say Salesforce MuleSoft? They told the same story around: Hey, we need to get data out of all of these places so customers can put it to work. GINNI ROMETTY: Yeah. Very big difference. So first, back up. This conference is about chapter two: scaling AI and now the cloud becomes hybrid. And the reason it becomes hybrid is because the first chapter of the cloud, a lot of customer facing new apps went on the public cloud. But now chapter two is you’ve got mission critical. That’s all on Prem that’s got to move, and it’s going to take containers, Kuberentes, open technologies to then move those. And what you start to have to happen is people end up with, in fact we’ve done studies, 40% in private cloud, 60 public. If you’re regulated, the other way around. And then you move data between and amongst those. And then have to manage them. That’s what we’re doing. And so the integration platform that you just mentioned that’s being announced is to allow you to manage data, services and apps, moving between these places and communicating between them. GINNI ROMETTY: First off, Salesforce is a partner of ours, too. Right? And remember, they work with Watson. We’ve got a lot of things. We’re the number one implementer of Salesforce. But when it comes to integrating apps and modernizing them, because chapter two here is going to driven by modernization of mission critical apps. That’s in our sweet spot. And so when you say ‘When do we see that?’, you saw last quarter our cognitive solutions, you saw that return to growth, you saw that hybrid cloud, very strong. IBM cloud private, very strong. And you actually saw in services business things like BNP Paribas, the biggest bank all to the cloud. You’ll see us announce another big financial services to the cloud while we’re here at this conference. And so you saw that with services backlog, 30% cloud. And so these are indicators that this is moving. JON FORTT: Tell me about CEO confidence. Last time we talked, it was a couple of days after the Fed Chair Jerome Powell made comments about being patient. The market really took an upswing after that. Have you seen the confidence of CEOs who you’re trying to get to continue to buy with IBM on a trajectory since then, have things improved sentiment wise or has it been steady? GINNI ROMETTY: I think it has been fairly steady. And I hear from all of my colleagues that everyone is still planning as I say both ways. On one hand, they’ve been planning down. You know, you can look at growth or efficiency. I would – if I just – you know, in a curve over time, as I’ve said, you would have seen more toward the growth side. I see that balance now between growth and efficiency initiatives. And I actually see that staying very firm. And they’re one foot in both camps. 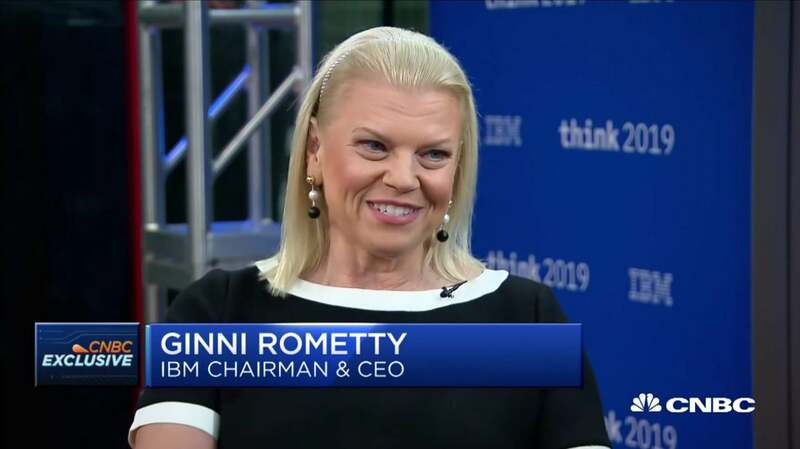 GINNI ROMETTY: You know, I’ve heard people talk about, ‘Is America behind on AI?’ And sometimes they liken it to ‘Well, other countries have more data. They can train, they have less policy around it.’ I want to remind, a lot of data for technology matters. But the AI we are working on is to train with less data. I mean the next state of the art rev on AI is less data. In fact, one shot learning gets called. And so, I don’t believe data is the only determinator – determinate, you know what I meant. And so to that point, ‘Do I think America is behind?’ No. And I actually think, you mention that executive order on AI, it’s a good step forward here. JON FORTT: Because you’ve worked with other countries who have done this sooner. GINNI ROMETTY: I’ll bet we’ve worked with almost 20 countries on their AI policies. And in fact, many countries have national policies around an industrial way that they’re going to go. So this is, I think, long overdue, but a great step in the right direction and calls out the right areas to be worked on. Part of it are the core technologies, R&D. You know, our department of energy that hosts our national labs which have the IBM super computers for AI in them, and those are a great bed to open up to learn. Skills that are out there. You want to have standards policies that are out there. And you want to use federal data so you start training ethical AI. So anyways, all good steps. JON FORTT: Speaking of these labs, IBM has been a big employer in New York State for a long time. Amazon is now trying to move into New York City, facing some push back. Queens might just say, ‘Thanks but no thanks.’If that happens, if Queens says ‘No thanks” to Amazon, what is the message to business? GINNI ROMETTY: Well, I can tell you what we’ve learned over the years, right? Because as you know, we are in 170 countries. And I have always said what I learned out of that, you have to be of the country you’re in. And so for us, we aligned ourselves with the agenda of the country, the city, no matter what it is, and really prided our self in being a great citizen of each of those places. And when you do that, you’re welcome everywhere. GINNI ROMETTY: Our lesson has always been to engage, understand what’s important, and some of the basics are important about skills, about jobs, and align to what you’re going to do with those. And I think that’s a lesson for everybody. JON FORTT: Finally, as we look out at what you’re doing at Think in the multi-cloud kind of hybrid environment, what’s a win for IBM coming out of this? What is different about IBM’s approach that you want people who are here who might also be at Dreamforce, Open World, et cetera, to come away with? GINNI ROMETTY: Yeah, look, in order — chapter two of the cloud is move to hybrid. That means you are going to go through a journey to take the applications you have today and modernize them. We give them both the services. We’re going to announce 23 end-to-end services for that journey today. The second thing we give you is, the software and cloud, public and private cloud, and all of the connection for any cloud, including our own, and on Prem, and then as well, software services, public cloud and we’re also announcing today the most secure public cloud. You will see an announcement later today that it is the most secure public cloud, something called Hyper Protect, that’s out there. So they would walk away and say: If I have to modernize mission critical apps, IBM is the only partner to do that.